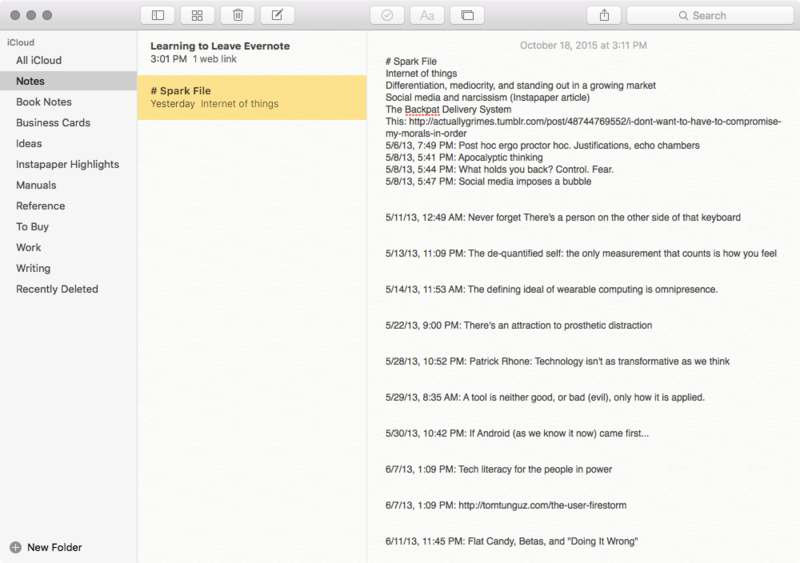 The Great Notes Migration of 2015 – Sanspoint. I’ve long struggled with how to keep the various flotsam and jetsam of my digital live in some semblance of order. One of the oldest pieces on this site is about that very issue. I’ve yet to find the right solution, bouncing between Evernote, nvALT, and a few other dalliances along the way. Until recently, I’ve been using a hybrid of Evernote and nvALT, but the multiple silo approached irked me. What I need is something flexible, that’ll store almost anything I can throw at it, something that syncs across all my devices: iPhone, iPad, and the Mac. It should let me sort, and search with easy. Preferably, it wouldn’t be a subscription service, but if it leverages something I’m already using and paying for, that’s fine. Finally, it has to be a company I can trust. I found my solution about a week ago in the last place I expected. It’s the stock Apple Notes app for Mac and iOS. I’m not alone. Aside from Stephen Hackett, other smart people I know and trust have switched to Notes, or at least away from Evernote. I can’t blame them for ditching Evernote. The Mac app is a bloated piece of junk with useless features you can’t turn off and constant nagging to upgrade—even if you’ve already paid. It got to the point where I paid five dollars for a replacement Evernote Mac client, rather than use the first-party app. What was worth it was Evernote’s flexibility. I kept manuals for all my gizmos and gadgets in Evernote, as well as scans of business cards and other various documents. 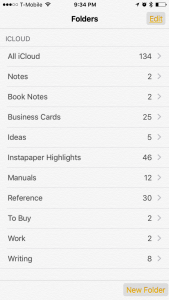 With IFTTT, I was able to pipe highlighted passages from Instapaper articles and receipt emails from purchases right into their own Evernote notebooks. I even kept my tax documents, encrypted, in Evernote. Notes.app does not have quite that level of flexibility or security, but I’ve found a way to pipe Instapaper highlights into Drafts using the IFTTT iOS app, which is super handy. The only thing I don’t have now is a way to deal with receipt emails, but they’re all in my gMail archive anyway, so I won’t worry about it. As for the tax info? I keep that in 1Password now. Had it not been for braver souls, I might not have even considered switching. 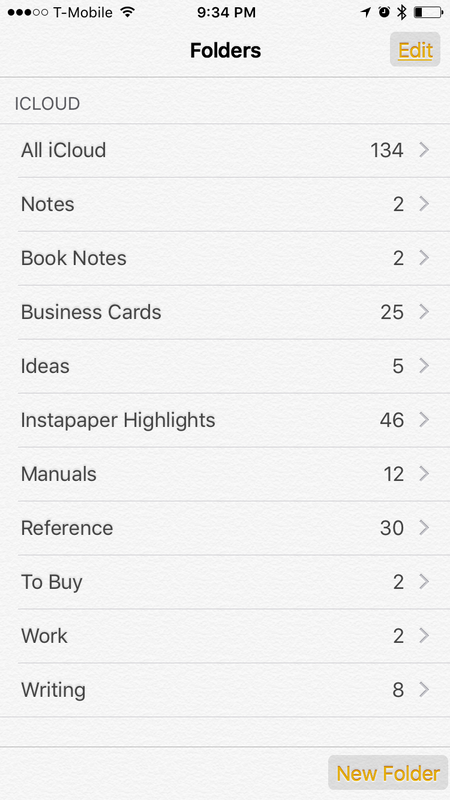 To me, Notes was that terrible stock app with the lined paper and Marker Felt text. It was the app where data goes to sit and decompose until you accidentally opened it. It’s sat in the bottom of iOS folders of stock Apple apps I never use and can’t remove. I’m amazed at how much power and flexibility Apple’s given such a neglected app. Sure, it’s still ugly, with that gross paper texture and the drop shadows on the text—and the Mac app isn’t much better—but it works so well that I can overlook it.